Being able to play games on your wrist is no longer a feature that only smartwatches can boast. Swiss watchmaker Hautlence has just revealed a peculiar piece called the Playground Labyrinth featuring a tiny 18k gold ball that can be navigated around a complicated maze just by moving your wrist. When you get the ball to its destination it falls through a tiny hole into the watch’s inner workings. But turning the Playground Labyrinth’s crown dial on the side activates a hidden mechanism that brings the ball up through another hole, back at the start of the maze. So you might be asking yourself, “if the watch’s dial is used to retrieve that tiny ball, how do you wind it?” You don’t, because the Playground Labyrinth doesn’t actually have any time keeping mechanisms. 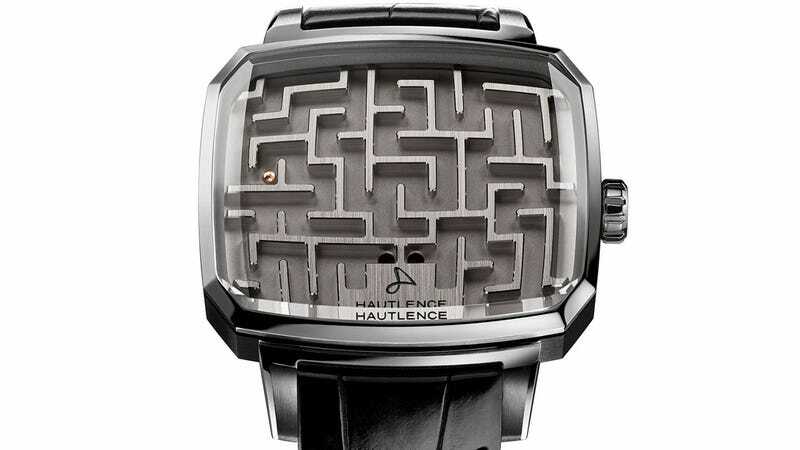 For roughly $12,600 all you’re getting from Hautlence is a simple ball maze with some flashy upgrades. If you want to know what time it is, you’ll just have to reach for your smartphone.